A month or so back, I found that The website Loving the Classics was offering DVDs of two silent films that I very much fancied seeing. One was the 1922 version of Arnold Bennett’s novel, The Card, starring Laddie Cliff; the other was the 1923 adaptation of A.S.M. 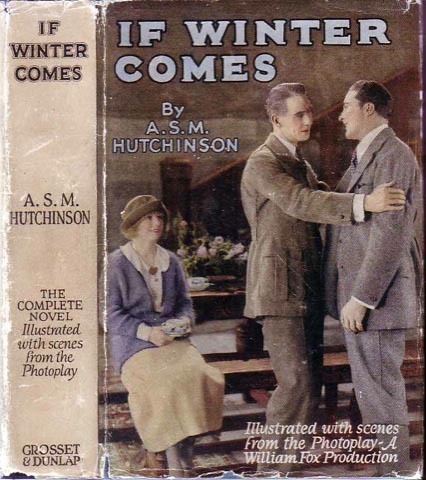 Hutchinson’s If Winter Comes, with Percy Marmont. The offer of The Card was especially exciting, since an expert who knows just about everything about Arnold Bennett had assured me that this was, like so many others from the silent era, a lost film, with little hope of rediscovery. My order for the films was accepted, but a short while later my money was refunded with a curt note. The titles disappeared from the online catalogue. I asked Loving the Classics what was happening, but they are not a very communicative firm. It remains a mystery. Yet the fact that they were offered in the first place means that copies of these elusive movies must exist somewhere, and that they have presumably been transferred to DVD. Googling has unearthed no other sources for the films, I’m posting this in the hope that one of my erudite readers may know of somewhere that they can be obtained. Any ideas? This entry was written by George Simmers and posted on July 25, 2012 at 9:57 am and filed under Film. Bookmark the permalink. Follow any comments here with the RSS feed for this post. Post a comment or leave a trackback: Trackback URL. Loving the Classics have now sent me a note to explain that the items were out of stock. They will let me know when they are available again. When I hear from them, I’ll pass on the information to anyone who is interested.